We handle your personal data according to current regulation (GDPR). Your data contsists of your name, adress, email adress, and telephone number. Juheko.com uses this data to provide you with its service. When you fill out your details in our webshop and accept our Terms and Conditions you give consent to juheko.com to use your personal data to provide the service and give your data to the shipping company that delivers the ordered products. Juheko.com may occasionally send you information about its products. However we don't send a weekly or monthly newsletter and you can opt-out any moment. You have the right to have your data deleted or handed to you any time. Juheko.com can only refuse deleting your data if it is needed to complete product delivery or receive your payment. You can not revoke your consent retrospectively. 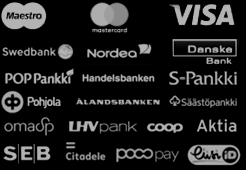 When paying for products via encrypted connections to banking services, security is guaranteed by those services and Juheko.com doesn't have access to the data handled by those systems.